Founded in 1994 by Richard Gilder and Lewis E. Lehrman, the Gilder Lehrman Institute of American History is a nonprofit organization devoted to the improvement of history education. The Institute has developed an array of programs for schools, teachers, and students that now operate in all fifty states, including a website that features more than 60,000 unique historical documents in the Gilder Lehrman Collection. 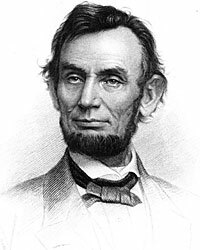 "In the untrammeled interior of the mind s eye, young Lincoln followed his unrestrained desire to explore new intellectual worlds, even the world of American history, of politics, of law. There, in the frictionless world of thought and fantasy, young Abraham Lincoln found the freedom, the vocation, the solace he yearned for, unshackled from the irremediable, unrequited, hard labor of farmer and village artisan." The stakes were high for Abraham Lincoln's first political speech in New York City and the first one in the East since he had left Congress more than a decade before. Please acknowledge The Lehrman Institute when using this research.